A hobby has turned from a passion to an obsession as I debuted the third website in a trilogy of Puget Sound soccer hangouts recently. In 2003 what would eventually become www.GOALSeattle.com went online. It's focus was to give Seattle fans a place to talk and to bring back to life memories of the NASL and early USL Sounders. It has evolved into the biggest archive devoted to any one city's soccer teams in the entire USA. In 2006 Tacoma FC were born at the very last minute, replacing the folding Spokane Shadow. I had always hoped Tacoma would get some kind of team. At one point I even traveled to various stadiums in South Sound scouting possible venues. The impossible romantic in me loved the cliff-hanging venue at Stadium High School the most. Now it is 2008 and Tacoma FC are called the Tide, and they will enter their third season in the USL's Premier Development League. www.GOALTacoma was a natural in part to the lengthy history of the Tacoma Stars, who were already a part of the GOALSeattle Museum pages. It's 2008, and we will see the birth of Seattle MLS in less than a year's time. From my loft-level computer post in Port Orchard (South Kitsap) I made the decision to continue the passion---and the program---by putting www.GOALKitsap.com online. The obsession continues. That's a good thing, though, right? 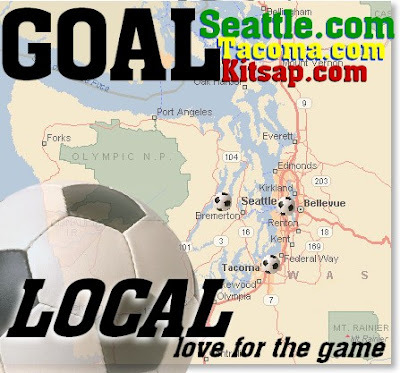 Kitsap County could well receive what is now the Seattle Sounders USL-1 franchise by 2009. Robin Waite, current Sounders co-owner, wants to build them a home and keep them alive after MLS invades the Emerald City. So now we have the trifecta: and finally the "GOAL" website series has reached as close to my actual home as we can get. GOALKitsap is part speculation and completely a labor of love. Right now only three people have registered in its forums in these early days. Hey, if you live in the greater Kitsap area, come on over and make it four! We'll follow youth, college and of course the possible arrival of the Sounders as 2008 comes into focus. I encourage you to adopt the "GOAL" website that is nearest to where you live, as well as the clubs that website supports. These are terrific times to be a soccer supporter in Puget Sound. Don't make me say that three times, because I will.